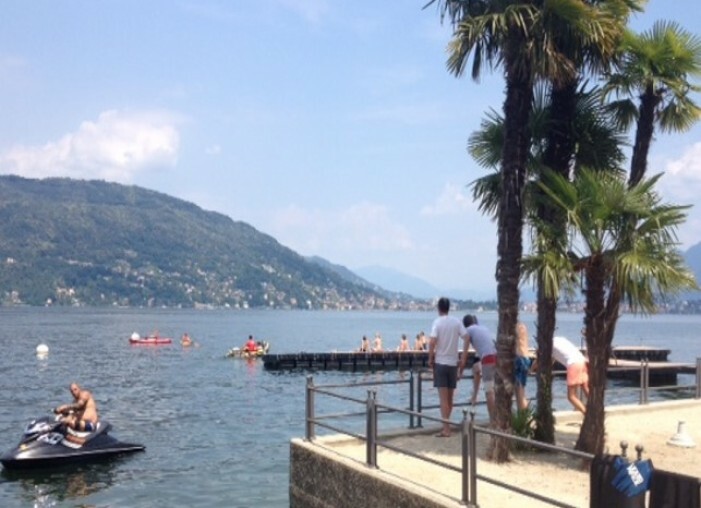 We were contacted by a French company operating in the food industry that wanted to organise a fun and relaxing day on Lake Maggiore as a reward for its employees. Our first thought was “What’s more relaxing than a day on the beach?”. The client absolutely agreed and we got to work. Our staring point was finding the location; a perfect spot on the lake’s shore within comfortable walking distance from the hotel. Next were the activities. Four hours on the beach could be quite exhausting without anything to do so we got ten kayaks with an expert instructor which were an instant hit and a bold bunch braved the waters of Lake Maggiore on an hour-long excursion. The remaining group had the choice between waterskiing, wakeboarding, donut and the spectacular flyboard! In between the activities they were offered a relaxing head and hand massage in the shade, with two masseuses working non-stop. The guests could replenish with mineral water, soft drinks and cold beers kept in an ice bucket and constantly refilled. They had three boats at disposal for the water activities and a flyboard with instructor/driver. This was of course the highlight of the day and everyone had a go at the flyboard at least once! The client was so happy that they wanted something to remember the day by, so we called our trusted photographer friend who came over in a heartbeat to take some beautiful pictures for them to take home. A perfect day on the beach!